Sitka black-tailed deer are cousins to the larger Columbia black-tailed deer of the Pacific Northwest, and both are closely related to the (even larger) mule deer of the American West. The Sitka black-tailed deer (Odocoileus hemionus sitkensis) is smaller, stockier, and has a shorter face than other members of the black-tailed group. Sitka black-tailed deer are closely related to the larger Columbia black-tailed deer of the Pacific Northwest, and both are considered subspecies of the (even larger) mule deer of the American West. Fawns are born in early June and weigh 6-8 pounds at birth. The average October weight of adults is about 80 pounds for females (does) and 120 pounds for males (bucks), although bucks of over 200 pounds have been reported. The summer coat of reddish-brown is replaced by dark brownish gray in winter. A Sitka black-tail buck’s antlers are dark brown with typical black-tailed branching. Normal adult antler development is three points on each side. Antlers are relatively small, with very few scoring more than 110 points by the Boone and Crockett system. The average life-span of a Sitka black-tail is about 10 years, but some live as long as 15 years. Sitka black-tail fawns are born in late spring, following the breeding season in late November. Breeding bucks spend little time foraging and by late November have used up much of their fat reserve, while does generally enter December in prime condition. Does breed during their second year of life and continue producing fawns annually until they reach 10 or 12 years of age. Prime-age does (5-10 years) typically produce two fawns annually. As the winter snowpack recedes, deer disperse and begin to move about; migratory deer move to high elevation alpine/subalpine habitats while resident deer remain throughout the forest at lower elevations. Summer and early fall are periods of active foraging as deer accumulate fat reserves to help get them through the winter and early spring. With the first signs of winter, usually the first heavy frost, deer in higher alpine and subalpine areas descend to upper elevations of the rain forest. 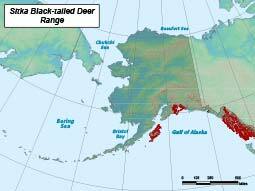 Deer populations in Alaska are dynamic and fluctuate considerably with the severity of winters. Mild winters generally allow for an increase in the population, but a particularly harsh winter typically spells decline for the population. The deer’s high reproductive potential helps depressed populations to recover rapidly. During summer, deer generally feed on herbaceous vegetation and the green leaves of shrubs. In winter they are restricted to evergreen forbs and woody browse. When snow is not a problem, deer prefer evergreen forbs such as bunchberry and trailing bramble. During periods of deep snow, deer eat woody browse such as blueberry, yellow cedar and hemlock, and arboreal lichens. This browse alone, however, is not an adequate diet and deer rapidly deplete their energy reserves when restricted to such a limited diet. Deer thrive on a mixed diet. These browsers eat the leaves and stems of woody plants and shrubs, as well as forbs – perennial and annual green forest plants. Unlike grazers such as cattle, sheep and bison, they very rarely eat grass. They do graze on emerging sedges on beaches during a short window in the spring. The Sitka black-tailed deer is native to the wet coastal rain forests of Southeast Alaska and north-coastal British Columbia. Its range has expanded as a result of transplants, and established populations now exist near Yakutat, in Prince William Sound, and on Kodiak and Afognak Islands. While virtually all of Southeast Alaska was covered in ice 18,000 years ago during the last glacial maximum, refugia did exist on Prince of Wales, Dall Island and areas to the west that are now submerged. Many animals persisted, including bears, marmots and even caribou, but no evidence has been found that deer were present in these refugia. The oldest deer bone in Southeast Alaska was found in Nautilus Cave on the west side of Heceta Island, dating at 8,180 years old. Deer likely moved north up the coast as the glaciers receded. Deer swim well and are found on all Southeast Islands except remote Forrester Island. Summer and winter home range areas vary from 30-1,200 acres and, for radio-collared deer on Admiralty Island, they average about 200 acres. Migratory deer have larger annual home ranges than resident deer. The average distance between summer and winter home ranges is five miles for migratory deer and half a mile for resident deer. Movement of deer between watersheds appears to be minimal during winter. During winter, the distribution of deer at various elevations is influenced by changing snow depth. During extreme snow accumulation, many deer congregate in heavily timbered stands at lower elevations and some may even move on to the beach. 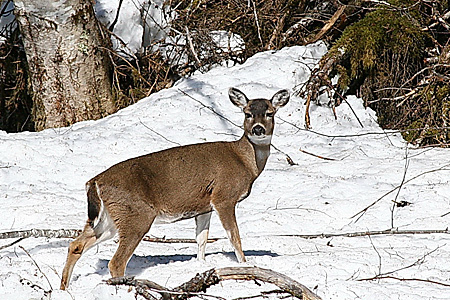 Deer research on Prince of Wales Island provides a general idea of how much habitat a Sitka black-tailed deer needs, and what deer densities are in good years in good habitat. That work indicates 20 to 25 deer per square mile. That’s about one deer per 26 to 32 acres. A NFL football field is 160’ x 360’ feet or 1.3 acres. An area encompassing 20 to 25 football fields is about the area needed to support a deer, and that’s good habitat with forage for winter and summer, with a mix of canopy cover and open areas. Deer have inhabited northern Southeast Alaska since their migration from southern refugia following the Pleistocene epoch. Deep snow keeps the number of deer on the mainland lower than that on adjacent islands. A population estimate suggests about 200,000 deer in Southeast Alaska (Merriam 1970). The Southeast Alaska region wide annual average harvest in recent decades has been about 12,300 deer. Deer populations tend to fluctuate seasonally, primarily in response to winter weather and wolf and bear predation. Clearcut logging has and will continue to further reduce deer carrying capacity in some areas. In some areas illegal hunting is also a factor. To determine trends in deer populations in many parts of Alaska, biologists conduct pellet group surveys. Biologists and technicians walk a transect line about a mile long, stretching from the beach to the subalpine, looking for deer pellets or droppings in a meter-wide line. Deer defecate with great regularity, 12 times per day on average per deer. Considering that as a constant, and how long the pellets persist in environment, it’s possible to take information on number of pellet groups and relate that back to the size of the deer herd in that particular area. The same areas are surveyed, so trends can be determined. Biologists consider anecdotal evidence as well as the pellet surveys when estimating deer populations trends. Reports from hunters, harvest data, deer harvest reports (which included effort even if no deer are harvested), and general sightings along highways also contribute to the picture. In some years, aerial surveys and mortality surveys have been conducted. Deer were introduced to the Yakutat area in 1934. Prince William Sound and North Gulf Coast (GMU 6) The Cordova Chamber of Commerce introduced Sitka black-tailed deer to Hawkins and Hinchinbrook islands between 1916 and 1923. Kodiak & adjacent islands (GMU 8) Deer were introduced to Kodiak Island in three transplants, totaling 25 deer, between 1924 and 1934. In 1930, two more deer were captured from Prince of Wales Island and released on Long Island. There was, however, little natural movement from Long Island to Kodiak, so in 1934, nine deer were captured in the Rocky Pass area near Petersburg and released on Kodiak. Deer populations are prone to dramatic population swings, largely attributable to severe winter weather. The 2006-07 and 2007-08 winters had exceptional high snowfall persisting on the ground late in the spring in Southeast Alaska, and evidence indicates population declines of varying severity, depending on the area. Of more concern, habitat capability and deer numbers are expected to decline in some areas as large tracts of previously logged areas reach the closed canopy stem exclusion stage and become extremely poor deer habitat. Population models predict declines in deer carrying capacity in the Ketchikan area of 50–60 percent by the end of the logging rotation in 2054. Prince of Wales Island has several issues: POW likely has the highest level of illegal or unreported harvests, estimated to be equal to the reported harvest due to extensive and increasing road system, lack of law enforcement personnel and high unemployment. In addition, actual hunter kill could be 38% greater than total estimated harvests from hunter reports because of crippling loss. During the next five to 10 years large tracts of previously logged areas will reach the closed canopy stem exclusion stage; large tracts of land will be converted to extremely poor deer habitat, and consequently, habitat capability and deer numbers are expected to decline. As of 2012, all samples collected from Alaska deer were free of chronic wasting disease. Up to 200 pounds, but more typically 120 pounds. Found in coastal rainforests of Southeast Alaska and north-coastal British Columbia. The range has been expanded to include populations near Yakutat, in Prince William Sound, and on Kodiak and Afognak Islands. Herbivorous; deer feed on vegetation and green leaves of shrubs, along with evergreen forbs and woody browse. Wolf, black and brown bears. Deer have 1-2 fawns annually, with twins being most common in does of prime breeding age. Alaska deer have been noted as being subject to a number of parasites and diseases, the most significant being lungworm.